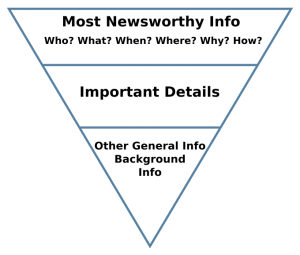 Take a page from journalism 101– increase link building and outreach response rates by using the inverted pyramid. When I was a Communications major with a concentration in Advertising, I had to share a lot of classes with the Journalism students. I’ve since forgotten the majority of the AP Stylebook and can barely speak much less write, but there’s one lesson that stuck with me—the inverted pyramid. If you’re not familiar with the concept, it’s a journalism technique in which the writer frames an article with the most important information at the top, details in the middle and more general information towards the bottom. The point is that most readers won’t get through an entire article so you want to give all of the facts as quickly as possible. If they’re truly interested in the subject, they’ll read through the details, but if not they still walk away informed. The “most important information” usually means the five W’s: who, what, where, when, why (and sometimes how). While this structure can kill creative license, it’s my professional belief that the inverted pyramid should be *the* standard for link development and outreach emails. The rest of the article has more words, but I’m busy, just like you and didn’t bother to read them. Why would I? I got the whole story in one sentence. You know who else doesn’t read past the first sentence? Email recipients of your link building and marketing outreach. Why don’t they read past the first line? You didn’t get to the point. You sounded like a robot. You sounded like that guy whose great uncle died and needs you to hold his money. You addressed her as Mr.
You addressed him as Madame. You didn’t say anything important to them. You talked about you the whole time. You didn’t get the name of their business right. Marketers, like journalists, have a responsibility to their audience to grab their attention and give them everything they need in one line or less. When doing link building, use the inverted pyramid for your outreach efforts. Put the facts in the opening line, details after that and if you feel it’s necessary add other relevant information to the end. Pair this structure with a personalized, appreciative and genuine tone, and you will see immediate increases in your response rates. No one likes to have their time wasted, especially when you’re asking them for a favor. Like Neil Patel, outreach recipients only have so much time in their lives. Save a life–use the inverted pyramid to drive link building success. Hat tip to Geordie Carswell for Neil’s contact form find.